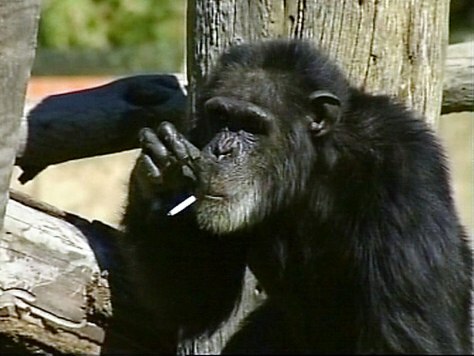 This video still taken, April 14, 2005, shows Charlie the chimpanzee smoking a cigarette at the Bloemfontein Zoo, South Africa. Qondile Khedama, a spokesman for the central South African city of Bloemfontein where Charlie had been a fixture at the small zoo, says the chimp died Tuesday, Oct. 5, 2010 apparently of old age. Charlie was believed to be 52.